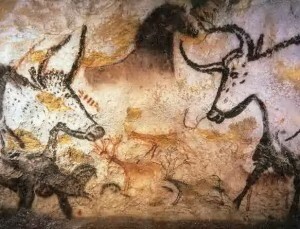 Click the title above for a fascinating viewpoint regarding the Lascaux Cave paintings (c. 15,000 BCE), which were found in the Dordogne region, southwestern France, in 1940. Many of the paintings seem to represent the animals in various stages of movement, the video linked above demonstrates how they may have been intended to be shown in a state of animation. This past summer I was lucky enough to visit the travelling exhibit “Lascaux III” at Chicago’s Field Museum of Natural History. This travelling exhibit features the incredibly realistic replica of portions of the caves. The Lascaux caves themselves have been off-limits to tourists since the 1980s (to ensure their preservation) and these replicas are the closest most of us are going to come to seeing the caves for ourselves. They are certainly a pretty good substitute, and the exhibit itself is wonderfully interactive and engaging. Lascaux III is currently at The Houston Museum of Natural Science until March 23, 2014. It will then be hosted by Le Centre des Sciences in Montréal, Québec from April 19 to September 15, 2014. Lascaux II, the permanent exhibit near the original caves, features similar replicas and can still be visited as well. If you are in any of these areas, I highly recommend visiting. I am a writer, artist, and an archaeologist; I love history and everything that goes with it!